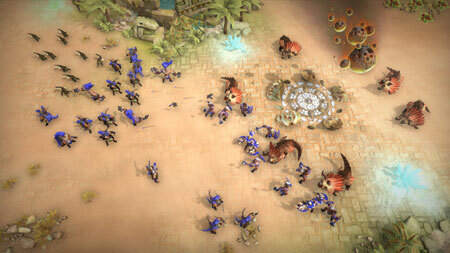 Warparty is a real-time strategy game developed by Warcave, Crazy Monkey Studios, set in the stone-age era. Build your base, recruit and control a group of soldiers, fight and tame fierce dinosaurs and direct the flow of combat. Proper management of resources, skills and map awareness will lead you to victory. In ancient times, a powerful civilization thrived, blending technology and magic to assert their dominion on the world. Eons have passed since their fall and nature has reclaimed its place, leading wild beasts and dinosaurs to roam the land once again. The tribes of men have emerged and grown in this savage environment. Using whatever tools at their disposal and harnessing the powers of the Ancients from the ruins of their cities and temples, they thrive and fight with each other for the limited resources of this world. Lead your people to victory, expand your tribe and harness the power of beasts and lost artefacts. Shape your people to overcome their rivals and become the uncontested rulers of all. If you get stuck in the game, check out the video walkthrough and gameplay for the game. This entry was posted in PC Games, Walkthrough and tagged Warparty Cheats, Warparty Gameplay, Warparty Guide, Warparty Strategy, Warparty Walkthrough by Marvin. Bookmark the permalink.